Many customers put faux finishes on their columns. There are many ways to apply faux finishes on your columns--texture paints, fleck paint, sponging varied colors--and bagging technique is also simple to do. Tea staining is another option and is easy to do. All of these techniques give you a unique look and can be maintained or changed for years of profitable uses. Faux columns (or Fake Columns) from Artesian/Column Designs can add a touch of elegance to your home, business, or tradeshow booth. Faux columns present a majestic and strong appearance and will last a long time. Faux columns are an inexpensive and imaginative way to add character a room. So, whatever your event or situation—big or small—our display columns will help you make it a success. Check out the faux column photos today! What kind of decorative columns are you looking for? These unusually light, tough decorative faux columns (also known as fake roman columns, decorative plastic columns, wedding columns, decorative roman columns) may be just the answer. The display pedestals and columns are made to order (14 inches to 11 feet) and will be wonderful decorative accents that can be installed permanently or set up for temporary displays or events. These decorative plastic columns are ideal for wedding columns, display stands, parties, banquets or tradeshows. Can be used as a decorative fake roman column also. How they can be used is only limited by our own imaginations (also known as roman columns, decorative plastic columns, wedding columns, decorative roman columns). The actual diameter of each column is 8" with the base measuring 11.25". 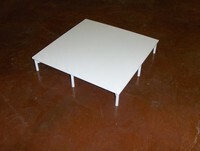 Custom Height Column available in various heights or +/- 1/4" of any height you choose. 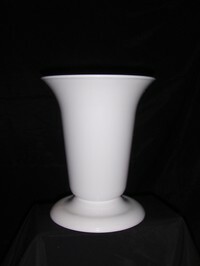 Converts any Column or Planter into pedestal. Removable top that fits securely into top of column. Ideal for displaying candles, art, plants or flower arrangements. 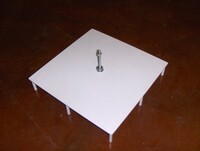 The connecting top is used to connect two or more columns together to make a arbor or gazebo. It sits down inside the top of the column and allows for connecting a framework or cross piece to top of columns. 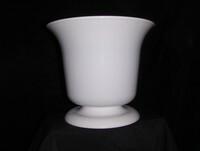 Tough white plastic urn for displaying flowers or silk arrangements. Simple elegant design so as to compliment, not to distract from other decor elements. Two piece assemble for easy storage and shipping. Additionally, if you are looking for wedding ceremony columns or wedding reception columns, we have wedding columns that will add that perfect touch to your beautiful day. 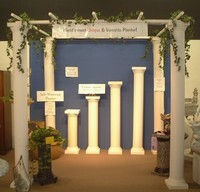 See our complete line of Wedding Columns, Decorative Columns, Plastic Columns, and Display Columns!